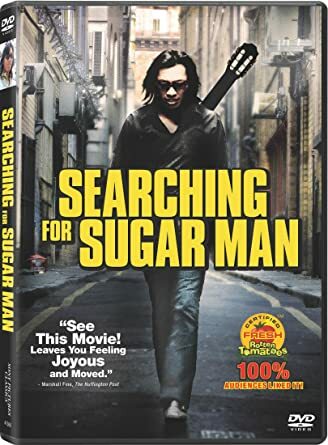 In one of those stranger than fiction tales, Searching for Sugar Man tells the bizarre story of a cult figure no one knew about...not even to a point the very cult leader himself. Sixto Rodriguez, whose songs became the anthems for generations of South Africans, was a shadowy figure to his fans, someone cloaked in myth and curious legends. What the filmmakers and the audience eventually discover is a remarkably humble man, one with great talent but no success in his native land. It would take decades and a distant shore to bring both his story and the man himself to light. Rodriguez was a singer/songwriter who released two albums in the United States, Cold Fact in 1970 and Coming From Reality a year later. Both failed to make an impression in the U.S. However, through some method or other (the film suggests that an American traveling in South Africa brought a copy of one which then was bootlegged until it went all around the country) both albums became the music to the counter-culture of that country, particularly among white liberals who opposed both the restrictive nature of the white minority government as well as apartheid itself. However, despite his status as an underground hero to the youth, no one knew what actually became of Rodriguez. The few bits of information and photos of Rodriguez were obscure and said nothing. The stories as to what happened to Rodriguez became almost as legendary as the artist himself. Most involved some form of suicide, ranging from shooting himself on stage to setting himself on fire. Many years later record store owner/Rodriguez superfan Stephen Segerman (nicknamed Sugar due to the similar sound of Seger/Sugar Man) and reporter Craig Strydom decided to investigate what exactly happened to Rodriguez. There was one dead end after another, in particular with regards to where the money went. The clues in his lyrics started pointing to Detroit, and the mystery starts clearing up. Then by the strangest of coincidences, the search for Sixto Rodriguez led to his daughter, Eva, contacting the searches to let them know that her father was not only alive but working as a construction worker. The news that Rodriguez was alive and well stunned South Africa. The news that he had a mass following in South Africa stunned Rodriguez, who was genuinely humbled that his music, which had long been relegated to obscurity in his mind, had not only reached millions but was a very important part of their lives. A South African tour was quickly organized, and a nation waited in anticipation. March 1998, Rodriguez sets foot in South Africa, and his humility transcends understanding. Neither he or his daughters realized for example, that the limousines at the airport were for them! At his first concert, the audience was in total abandon. Just playing the first chords of his song I Wonder had them in fits of shouting glee. A clearly taken aback Rodriguez stops and tells the crowd, "Thanks for keeping me alive." What makes Searching for Sugar Man such an extraordinary film is that it is so many films wrapped into one. It is a mystery story: a search for a long-lost shadowy figure that bears fruit. It is a redemption story: the inspiration behind political activism to bring down apartheid had been found and found alive. It is also a hopeful, optimistic story: the man who long ago lost a career now has belatedly been given a second chance. What one gets from Rodriguez is a man of great talent but great humility (two things that rarely combine). When he finally appears on camera, he seems highly reluctant to be there, his face still slightly obscured by his sunglasses. In South Africa, he appears distressed to hear some of the stories about he supposedly died. We also get some of his songs from his two albums, and find that they are wonderful songs. Listening to Establishment Blues one can see how it inspired both fear from the government and hope for the antiestablishment. Rodriguez, as a man and artist, is a great find: someone who loves his works but also has not grown bitter or angry about not having collected the millions he was entitled to. Indeed, he has never shown any resentment over living in near-poverty and working in construction. Rather, he seems to have accepted it all as part of life, nothing more or less. Despite all the things that have happened to him, Sixto Rodriguez appears to believe he's had a good life. We get how his songs inspired so many in South Africa (particularly given how strict the censorship was in the state) and the enthusiasm his fans have for his music. About the only thing that is never answered in Malik Bendjelloul's film is whatever did happen to the money. This trail is left cold, and whoever got the cash from Rodriguez's work (since Rodriguez clearly never did) is one mystery Searching for Sugar Man never answered.